Tiger Sorubim (Pseudoplatystoma tigrinum) | Better Know a Fish! O, Facebook. That tar-pit of humanity. Drawing in every speck of dirt and whimsy blowing by, sucking us in and draining our mortal life. A dark, mirror pond of selfies, foodstuff, engagement rings, and baby beings (human and otherwise), forever tempting new victims into its depths. But it can be a great place to score new fish photos from friends. Clinton, a fellow writer, is notorious among our circles for his photo posts. Selfies in the dentist’s chair. Selfies at the salon at the shampoo sink. The socks of the day. The necktie of the day. I jest in fondness — Clinton’s posts are hilarious, and he is particularly interactive whilst traveling, posting questions to us live on the road then getting crowdsourced advice back, not to mention taking requests for scenes for snapshots. I took these photos at the Belen Market in the Belen district of Iquitos, Peru. Iquitos is the largest city in the world that’s not accessible by road. Belen is an especially poor and rough barrio in Iquitos. The market makes practically everything available, from vegetables to fresh meat (pick your own chicken, or grub worm) and fish to outdated antibiotics that haven’t been on the market for years and portions that portend to cure everything from low libido to cancer. There are, no doubt, other commodities for sale, of which I did not partake. Nor did Clinton partake in the wares of this fishmonger’s table: specimens of the catfish genus Pseudoplatystoma, known as the sorubim or surubíes. Based on the markings — and assuming the fish were actually caught near Iquitos — the three specimens on the left would seem to be the tiger sorubim (Pseudoplatystoma tigrinum). The lone specimen to the right would seem to be the barred sorubim (Pseudoplatystoma fasciatum) — alternatively Pseudoplatystoma punctifer, depending on the taxonomic study tackling the matter (see Buitrago-Suárez and Burr 2007 versus Carvalho-Costa et al. 2011). The sorubim species haunt various river basins in tropical South America, and their colloquial names vary by location and language. Local names listed for the tiger sorubim include tigre zúngaro in Peru; surubim tigre and pintado in Brazil; bagre rayado in Ecuador and elsewhere; and one assumes a smattering of indigenous names. 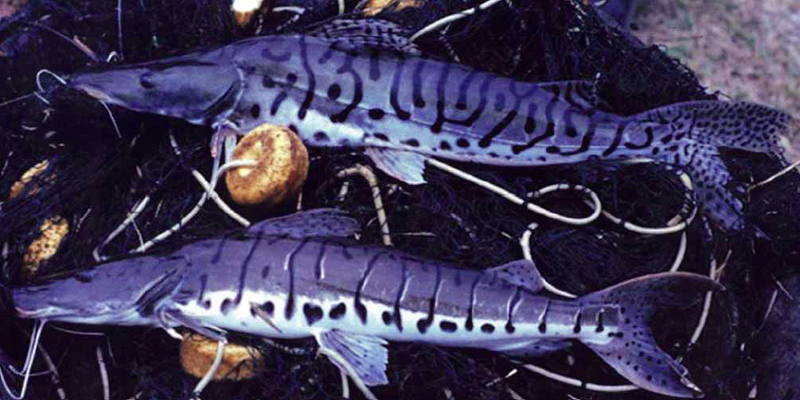 In the U.S. aquarium hobby trade, some sorubim species are labeled as “tiger shovelnose catfish” — recognizing their distinctive flattened snouts and markings. That they are even considered home aquarium fish is astounding. 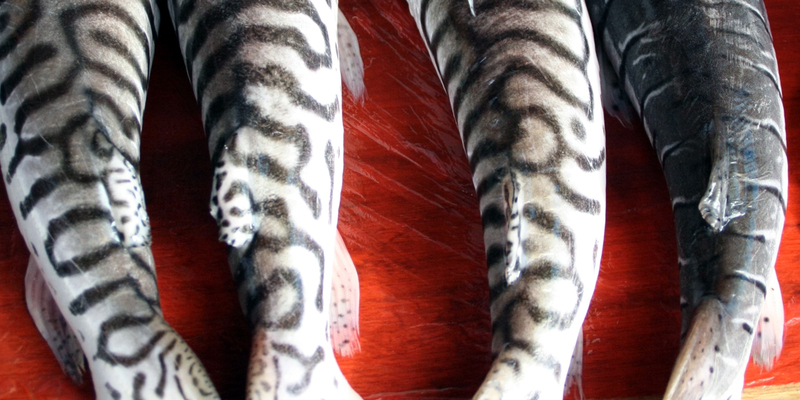 These catfish grow into gigantic predatory gamefish — the tiger sorubim has a maximum recorded length of 1.3 meters (4.25 feet), while another species, the spotted sorubim (P. corruscans; video below) has recorded maximums of 1.6 meters (5.45 feet) and 100 kilograms (220 pounds). The sorubim are also highly prized commercial foodfish — to the point that fillets from other species have been sold and passed off as sorubim. One study conducted DNA analysis on 33 fillets and 30 whole fish being sold as surubim across supermarkets in the city of Belo Horizonte, Brazil, and found more than half did not belong to sorubim species (Carvalho et al. 2007). Those fillets belonged to non-Pseudoplatystoma catfish species — including a marine catfish from Asia — and some even belonged to an entirely different group of fishes, the drums. And what of the whole fish being sold? All of them were genetically confirmed to belong to Pseudoplatystoma species, mixed between the tiger sorubim and the spotted sorubim. Hard to fake a whole fish. It looks like, however, that people are looking after the sorubim. I love that they have a giant statue of a sorubim in front of their fish farm (jump to the 10:35 mark). So thanks again, Clinton, for granting my Facebook photo wish. It was one snapshot out of many from your trip to Peru — but one that helped us better know a fish. Now please take a selfie with this blogpost. This entry was posted in Actinopterygii, Freshwater Fish, Siluriformes and tagged aquarium fish, bagre rayado, barred sorubim, caparari, capari, doncella, gamefish, long-whiskered catfishes, peces gato, Pimelodidae, Pseudoplatystoma, Pseudoplatystoma fasciatum, Pseudoplatystoma tigrinum, seafood, Siluriformes, South America, surubí, tiger shovelnose catfish, tiger sorubim, tigre zúngaro. Bookmark the permalink.